My Mobile Page V2 WordPress Theme is a unique wordpress mobile theme with some amazing new features, 100 % customizable, fluid layout, automatically resized to every mobile resolution, auto device orientation resizable, custom admin panel. It has custom admin panel from where you can: add your custom logo image, customize home menu icons, adding new icons through custom post types, add photos in gallery page and a lot more. It’s a WordPress Mobile Theme Framework that converts your site into a gorgeous layout which is compatible for mobile devices. Stunning design, attention to detail and unique features make your site stand out when visitors hit your site with their phones. Obox Mobile comes packaged with awesome themes to choose from including two Obox Themes (MobiLight & MobiDark versions) as well as WooMobile from WooThemes! It doesn’t matter which way you hold your phone, Obox Mobile will always render perfectly with automatic adjustments to horizontal or vertical orientation. All Obox Mobile themes come with a built in featured slider which works just as it would in a normal iPhone App. Simply drag your finger across the screen to slide between posts! With Auto Upgrade feature you no longer have to worry about uploading hotfixes into specific folders. Simple Mobile is a WordPress theme designed for mobile devices, especially iPhone. It can be used parallel with another theme and presented to mobile users only. Or you can use it traditional way – present it both to desktop computers and mobile devices users. The code is clean and optimized. Start your first iPhone blog, online diary or however you like to call it. Sofa iBloggr perfectly fits to 320px wide screen without the need for screen orientation switch. All other desktop computer Browsers are capable to run this theme with no issues as well! You can easily turn this theme into Blog + Flickr + Twitter mashup. iBloggr supports widgets, it has built-in Plugger system, almost everything can be controlled from theme options page – including quick translation table, image size, Post excerpt length. dotMobi can be used either as a standalone blog OR in conjuction with one of the many plugins that offer theme switching according to the users platform. Although compact in design, this theme offers all the features to the user that a normal WordPress blog theme has to offer, in other words it doesn’t cripple the users browsing experience by hiding archives and categories selection and other browsing options. The dotMobi WordPress theme can run straight out of the box with no plugin’s required to get it up and running. There are two built in widgets and a widget ready area to allow for greater expansion. The built-in twitter widget caches your twitter RSS feed and only refreshes every 60 minutes to avoid the twitter API call limit and to help keep your blog running quickly and smoothly on each and every page load. This application helps you to create in no time a mobile version of a website. This script supports all major devices like iPhone, Blackberry, Android devices, PSP , Windows mobile, Opera mini devices and other generic devices. With this script there is no need for you to create a subdomain for your mobile website. This script detects if the visitor is using a mobile device and then shows the right versions. To implement this script on your website you only need to include one file in the index.php file of your website. This way it’s possible to use this on any kind of website: wordpress, joomla, drupal or just custom written. Coupled with Press75’s Video Elements theme (V2.5), Video Elements mobile allows you to run video centric websites on both PC and mobile platforms. It fully supports self-hosted MP4 videos on iPhone/iPod Touch, Android, Touch-based Blackberry and Nokia phones. HTML5 optimized. Fully supports M4V, Vimeo, Youtube embedded videos on iPhone/iPod Touch, Android etc. Designed in Video Elements style and optimized for mobile UI. Fully supports Press75’s Simple Video Embedder plugin. Fully support WordPress Post Thumbnails (WP2.9+ required). Full WordPress search, pages, archives, categories, tags and links support. You can choose your own theme color from the theme options (any color you want for your theme is just a click away). You can define your own width for your theme. The theme can have 100% width if you want the theme to fit on every mobile phone, or you can define a fixed width in pixels to target special users. The front page will dynamically create thumbnails for your posts. 1stGiantLeap Mobile is a HTML5 /CSS3 template tuned to look perfect in mobile browsers. The markup is device orientation sensitive, so when you change device orientation by rotating it 90 degrees CW or CCW this template will look nice. This template will fit perfect for a mobile blog or magazine, maybe even for mobile portfolio. It might be very useful for those who purchased 1stGiantLeap template because this was supposed to be a mobile version of this template. WPtouch ProTM is a WordPress plugin which adds powerful, easy-to-use features to WordPress for mobile + tablet theme support. 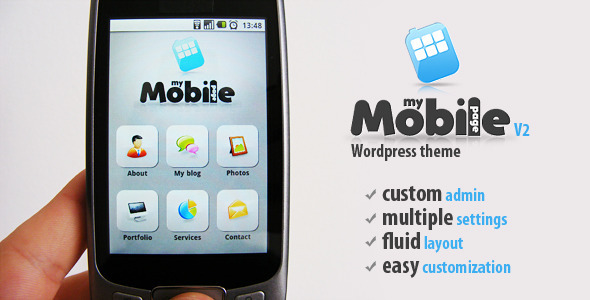 It’s also a powerful theming framework, perfect for creating awesome mobile & tablet optimized versions of websites. It works by detecting supported devices like iPhones, iPads, Android & Blackberry and more, serving its optimized theme instead of your regular desktop theme. Visitors can always switch back to your desktop theme if they choose. The plugin doesn’t glue together RSS feeds, or use a proxy server to modify your site’s look— It creates a full-fledged theme, completely separate from your desktop theme that offers most of WordPress’ native features, & works with other plugins, too. WPtouch Pro includes 200+ great new features over the free version with powerful options in an easy-to-use admin. It also includes great customer support and free upgrades through all 2.x version releases. Thanks for pointing me to these nice themes! I think these will come handy as mobile applications are hot and will be for a while. Thanks for sharing! cheers for the new themes these will come in very handy! Your article is very helpful. Thanks for sharing.